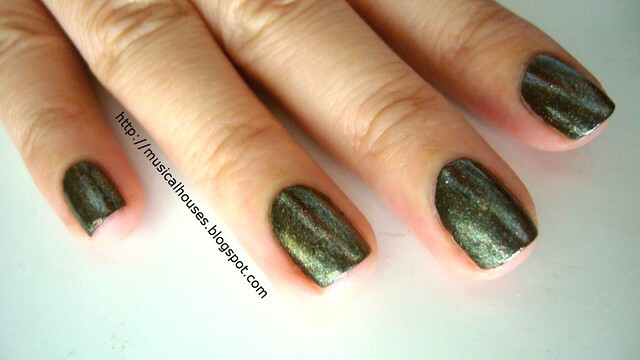 After doing my green/gold Christmas eye look, I was left staring at my Evil Shades loose eyeshadows, and a thought came to me - wouldn't it be awesome if I could have a nail polish with a finish like that? And so began this experimental NOTD. For this NOTD, I used Nails Inc Fitzhardinge Street as a deep green creme base, and basically loaded my Evil Shades eyeshadows in Ice Star and Morning Star over it. I picked these two shades because they have more chunky glitter than the rest of my eyeshadows, which made them perfect for adding some glitter to my nails! I know people do franken their own shades, but I didn't feel up to an all out franken, since the last time I tried to mix my own colour, it was a big fail. Instead, I waited til the nail polish was semi-dry, and then sprinkled the eyeshadow powders on top. Surprisingly, this was actually easy to do. The glitter stuck to the polish, and I realized how easy it is to create a gradient look with this method. Just imagine all the possibilities - gradient manis, glitter tips, and galaxy nails! I'm honestly quite excited to try this again. The only downside is that after I was done, my fingers were all smothered in eyeshadow powder, which was a total pain to remove. Although I washed my hands numerous times, there was always some glitter stuck somewhere, LOL. Glitter adventures aside, I love this look and I think it's a great way to experiment without going all the way to frankening new shades. And it's also an awesome way to find new life out of loose eyeshadows that you don't often use and would otherwise sit untouched. These are so pretty. You did a great job. Great idea for glitter lovers! Wow! I'd never have thought of that but this looks really nice! So well done! Yours look great!